There are many excellent reasons for choosing to ride a bike. Cycling is great exercise, good for your health, and a practical way to commute. But it is also not without risks. Getting ‘doored’ (when a stopped or parked vehicle suddenly opens its doors into a cyclist’s path), or clipped by vehicles passing too close or failing to check their blind spot when turning are just some of the perils facing cyclists. 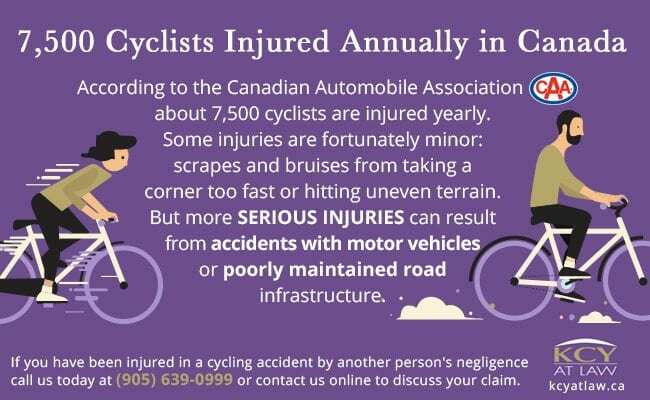 According to the Canadian Automobile Association (CAA) about 7,500 cyclists are injured yearly. Some injuries are fortunately minor: scrapes and bruises from taking a corner too fast or hitting uneven terrain. But more serious injuries can result from accidents with motor vehicles or poorly maintained road infrastructure. Lacking protection of an enclosed frame, cyclists are particularly vulnerable to serious injuries in the event of a collision, especially with larger, heavier, and faster vehicles. Moreover, analysis from police collision reports finds that most common causes of collisions involve motorist errors. If you as a cyclist have been injured in a collision or accident, you may have the right to make a claim for compensation. This may take the form of an accident benefits claim against yours or the driver’s insurance. It may also be pursued as a civil suit for damages against a negligent driver, or against the government body responsible for the hazardous infrastructure but to best handle your claim you should work with a bicycle accident lawyer with experience. The issues in auto-cyclist cases are similar to those brought forth in an auto accident lawsuit. Cyclists can claim damages for pain and suffering, loss of income and other detrimental outcomes of an accident. Collisions are generally paid for by car insurance. Unlike motor vehicles, however, cyclists do not require licenses or insurance. What then happens in the event of an accident? In the case of an accident with damage to you or your bike, your bicycle may be protected by your home or car insurance. Additionally, dependents may be covered by their parents’ policy. In the unfortunate case of a hit-and-run accident, a cyclist may be able to seek compensation from Ontario’s Motor Vehicle Accident Claim Fund. This however, is the coverage of last resort. Sometimes, however, an accident is neither a cyclist’s or driver’s fault. The 2006 case of Johnson v. Milton (City) illustrates the responsibility of municipalities to maintain safe road conditions and infrastructure. In this case Mrs. Johnson sued the municipality of Milton for an accident caused by the disrepair of Fourth Line Road that resulted in her husband’s death. The judge ruled in favour of Mrs. Johnson, finding that the city should have known about the road’s disrepair and, at minimum, warned cyclists of the hazards. The City of Oakville was found liable and Mrs. Johnson was awarded $1.3 million in damages. Determining the value of your accident claim requires the experience of a personal injury lawyer. 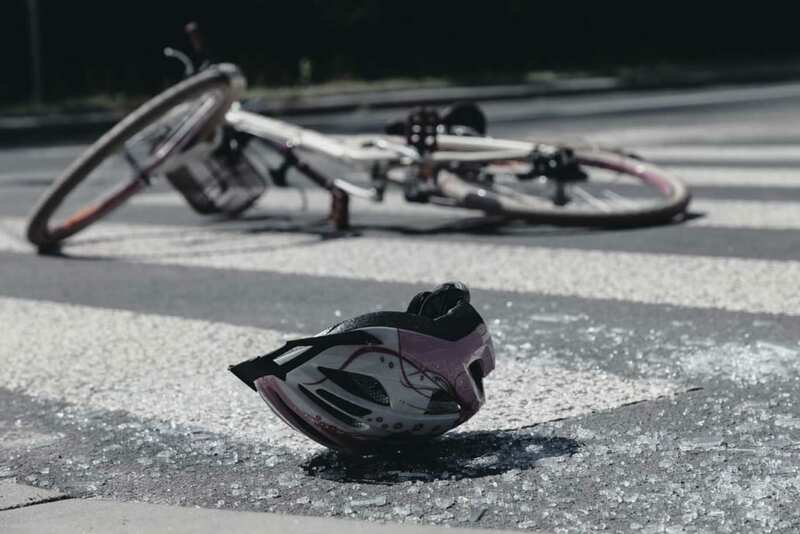 KCY at LAW have helped dozens of cycling accident victims establish a compelling case and gain appropriate compensation from at-fault drivers and government authorities responsible for road infrastructure. 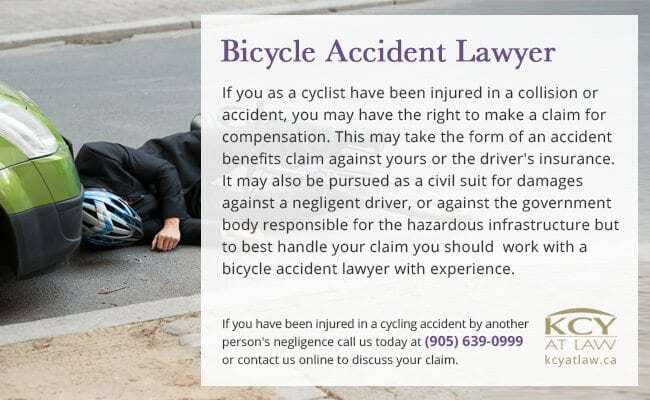 If you have been injured in a cycling accident by another person’s negligence call us today at (905) 639-0999­­­ or contact us online to discuss your claim.